The Upbeat Dad! : Congrats on Making the Honor Roll!! ﻿ This morning I was as proud as I could be as a father. 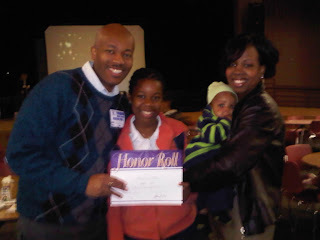 Our family was invited to our 12 year old daughter’s school as she was recognized, along with several others in her school for being on the Honor Roll. For many parents, that recognition is something that they take for granted because it’s so routine. But for me, this moment is very special and I will not forget it anytime soon. Our daughter is in the 7th grade. She’s very intelligent and quite articulate. Still, there are times when she loses focus and her grades don’t reflect her true capabilities. 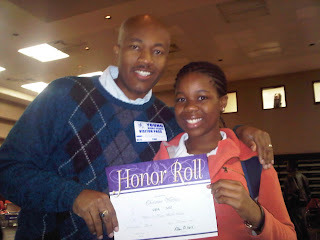 As this school year started I challenged her to make the Honor Roll each grading period this year. And if she does, there’s a special item that she wants that I’ll get for her. Last year as our daughter struggled, my wife and I met with her teachers to try to figure out why there was so much inconsistency in her grades. She was on the Honor Roll for most of her time in elementary school so we had to analyze why she struggled. I confess I got upset with her a few times because I just felt that she was not performing up to her capabilities. But I tried to be conscious of the words that I used to try to get her grades moving in the right direction. I used phrases such as, “Where’s my straight A student?” and “There’s no one in your class who’s smarter than you. You’re the very best.” These were words to build her self-confidence. We met with her teachers and before long we realized what the problem was. In each grade in elementary school, she had 1 teacher. She went to class and for most of the day, she was in that classroom. She learned the teacher’s teaching style and the teacher learned her learning style. So after a few weeks, they had a good system to facilitate the learning process. In her new school however, she has 6 classes and 6 different teachers. Each has his/her own teaching style. And now she has to carry her textbooks and notebooks between the different classes. It may not seem like much but for an 11 year old, it can be overwhelming. In the past, her teacher would figuratively hold her hand and guide her along. Now she was somewhat on her own. So if she forgot to write down an assignment or that she has a test coming up, she would go to school unprepared. We established an accountability system that’s filled with rewards as well as consequences. Television and cell phone privileges had to be earned, not just given as we had previously done. We’ve just changed our overall approach and I’m so pleased to see that our collective efforts are paying off. Let me also add briefly here that our kids’ grades are our responsibility first. The schools should simply be partners in our children’s education but they are our responsibility first. From a practical standpoint, our children attend a particular school for a finite time. And if they’re successful, they graduate and move on. The school is no longer responsible for their education. But once a parent, always a parent. 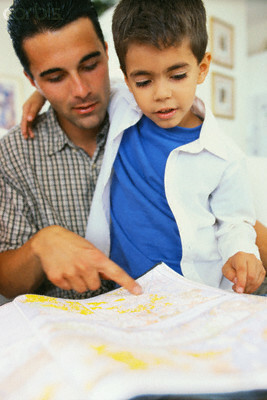 Our children are always ours so their education is our responsibility primarily. I encourage you dads and moms to see the very best in your kids. If you don’t, then who will? Just last week I learned that United States is #14 in the world in terms of students’ academic performance. The results were based on a standardized test taken in students’ early teenage years. This is the worst ranking in several years. Based on the analysis that I saw on NBC News, the poor performance is due to a variety of factors including teacher qualifications and pay, education funding and overall prioritization of formal education in each nation. As the parent of a 12 year old daughter and a newborn son living in the United States, those statistics concern me. At the same time, I know that whether we have high performing schools or low performing schools, I want my children to get the best education possible. So I’m willing to do what’s necessary to provide them with the best resources so that they can be competitive in our changing, advancing world. If your kids aren’t performing at a high standard, do encourage them to be their very best. And speak words of encouragement to them. Believe me, sooner than later, you will begin to see the positive results that you look for. Let’s build up our kids and not tear them down. As a child in school in Jamaica, I was taught the very simple saying, “The boys and girls of today will be the men and women of tomorrow.” And guess what? Today is tomorrow. And now I’m a man. And the lessons I learned then still guide me today. Have an excellent `upbeat’ day. Roderick, I really enjoy your writing. Your topics are on point. I am a former High School Teacher, and I couldn't express those sentiments better myself. You got the point! Let us hope that other parents get it too. As a Nurse, and community outreach volunteer worker, I must admit that your thoughtful writing is very motivational and insightful. I applaud you for the dynamic efforts that you are making, to empower members of our community, especially dads, who may be feeling down and out. Your words ring through with so many profound truths. Thanks for the touch of nostalgia that you add so frequently with your words from the home country. You definitely make us proud. Yes, I am glad that you finally gave birth to this wonderful and necessary blog. Your work is very therapeutic and I believe that quietly, you will cause healing in the lives of many men, including the disadvantaged and the under-served. Our community nonprofit, Family & Friends Connection, Inc (FFC)(www.famfc.org)shares your outlook and will endeavor to continue working to help provide empowerment to men, women and families, in our local communities and all over the world. Roderick, you are a blessing and I hope your readers realize that.